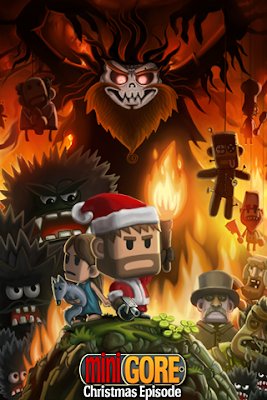 Minigore: Minigore Christmas Episode submitted! Episode 3, The Christmas Episode, has been submitted for App Store approval! Sooo great!! Thank you ! Spectacular update! Looking forward to it. Now THAT'S what I call a Christmas present! Thanks K&T and all Betas for all of your hard work! Looking forward to Ep.4! lets hope this doesn't take as long as last time! on the ds you can aim with your stylus and move with the pad. Minigore you guys shouldve added a forum to oyur site,or at least add a page for each of your games. that way we don`t have to keep switching from posts and we all have to have accs which can be banned. Nice work Mountain Sheep, can't wait. Wow this looks super badass! Can't wait for this and then for co-op! Looks great! Wasn't Lizzie from Sway supposed to be in it too though? Looks like there's enough to keep us occupied regardless! What happened to the zombie idea? how come that liz isnt a player? Anon (above me), Lizzy will be in the next update with co-op. I bet kid gore will be a younger version of John gore oy maybe his son? On the openfeint achievements it says to get Evan you need 14000 points, for enviro- bear you need 32000 points and for sensei Evan you need 1000000 points. Is that in one sitting or in total? @playn- what's the difference between points and kills? How would people have abused the points system but not the kills? White lies, just a little white lie. I do them to get close to you, and i will tell another million, white lies. So we have to kill 1000000 minifurries in one sitting just to unlock sensei Evan? I hate to sound like a Pansy but that's really hard!!! How the hell do they expect me to beat 100000 furries? Everyone, the kills are cumulative. And Playn, zombies are planned for episode 4. Fact. How do you know zombies are ep 4 fo sho? how will we know how many kills we have to unlock the characters????? no that is not fact. if it were fact it would be up the top of the page where it sais "planned for episode 4"
we're getting co-op, more characters, possibly new types of game modes for ep4 already. zombies just doesnt fit into that episode. Yes, it is fact. I can't tell you how I know, and if you don't want to believe me then don't, but I know that Zombies are planned for Episode 4. Playn has a point, if you are unable to produce a proper source, yet keep the source unknown, we assume that there is no source, and that you are only claiming it. Thats the way it works, if i tell you that minigore is being dropped and mountain sheep isnt doing anything anymore from a source that i cant tell you, how are you supposed to believe me? For anyone wondering, he has this relationship with mountainsheep, hence its like a treaty he cant break, and he breaks it by telling us. So if i have a first generation iPod touch, will co-op be supported on it if i have a strong Wi-Fi connection? will i need friends on openfient or can i just join a game? by the way, gore needs more lame one liners. the lamer, the better. Ok, I think I have a good idea and please people... Constructive Criticism. When I was playing minigore while watching my friend playing Call of Duty Modern Warfare 2. He got an emergency airdrop. I thought wow what if in minigore something like that would happened. So after some pondering I thought of a Fair way to use this. I was thinking every furry you kill it adds to your kill score along with your other score if you kill a certain amount idk maybe something like every 500 furries (1000+ points) you would have had something dropped on the map by santa it would be a different looking box. It first would have a minigun or some other sweet weapon like flamethrower. Next killstreak would be at every 1000 kills (2000+ points) it would be something that would distract furries to get away from you. Next would be at every 4000 kills (8000+ points) you would have santa or some other character use a vehicle or special move relating to themselves or game to kill all the furries on the screen. NOTE!!!! : WHENEVER YOU GET HIT YOU LOSE YOUR KILL COMBO and it starts back at zero. I wish we could prove he was an actual beta tester. I mean any one on the Internet could start bsing with random facts that might not be true I mean I could say" I'm close to the dev and he tells me more than ever one else chuck Norris is planned for episode 7 but they only told me it's pretty awesome"
We'll let you know about the zombies in the not-so-distant future. We are working on them, but haven't made the final decision about which Episode they'll go. @Anon: You don't plan for Chuck Norris, he decides what course of action you will take. @Cheesz: Combos / kill streaks. I like that. I think it could be used to boost the abilities of the player a little in addition to (or instead of) rewarding them at specific intervals with airdrops. @Brian: Co-op will work over wi-fi on 1G Touch in your local area network. OpenFeint friends are not required. I was the anon who was BSing saying that I've done co-op that was a lie I made to prove a point...anyone can say anything on here as an anon so don't believe them and kimmo just helped me prove it! uhhhhhhhhh, im frusterated, but still love minigore and cant wait for zombies. HEY GUYS, IM 150% POSITIVE ZOMBIES ARE GOING TO BE IN EPISODE 4 DONT QUESTION HOW I KNOW BUT TRUST ME I KNOW, OH BY THE WAY IGNORE KIMMOS COMMENT I MEAN WHAT DOES HE KNOW, I MEAN HE JUST WRITES THE GAME WRIGHT!? HOW COULD HE POSSIBLY KNOW ANYTHING ABOUT THIS GAME!? SO ANYWAY JUST WAIT ITLL BE IN EPISODE 4 I HAVE SO MANY SOURCES ITS NOT EVEN FUNNY BECAUSE YOU KNOW IMA BETA TESTER AND I PRACTICALLY CAME UP WITH THE WHOLE IDEA FOR THIS GAME, YOU KNOW, OH SOOOO YEAH THE OTHER DAY I TALKED TO OBAMA AND HE SAID HE LOVED ME AND IM AWESOME AND ALL THAT STUFF AND HES GOING TO APPOINT ME TO THE HEAD OF THE MINIGORE DEPARTMENT AND THEN I CAN GIVE YOU GUYS EVEN MORE INSIDE DETAILS, EVEN WHEN THE CREATORS OF THE GAME CANT! NO WAY RIGHT!? OH YEAH OMG SHOES! Look at the last picture, and the text that accompanies it. The post was made AFTER Kimmo posted, so it's possible that MS decided about which episode the zombies would be in, and sent off a preview to TouchArcade. I don't know but evidence is pointing towards ZOMBIES! b)I don't want to have to delete my TouchArcade account or email due to excessive FLAME! Does that look like Lizzy's hat to you? Question for guys that are in beta. What do I need to do to be in beta? Do I need to send my leaderboard name and place, or what, cause the thread named "Testers" is kinda old? loving the video of the new characters on youtube!!!!! cant wait!!! i read that the next EP has DLC does that mean you guys are charging extra for the other map? Okay! I just checked the TA forums page about the EP.3 teaser, and I'm really concerned about the whole Downloadable Content deal. I want a CLEAR, TRUE, STRAIGHT TO THE POINT answer! TA is in total chaos about that issue, and its 50/50 on the forum! KIMMO and TIMO, can ya'll PLEASE put this issue to rest and tell us all if the Downloadable Content is free or not! That'd be great! Ah thats nice. Would that 'hit-to-dash' effect then become the new Dash skill then? It's not difficult to work out. The DLC costs muneys. Sweet! It all makes sense now. Thanks guys for putting that s*** to rest, lol! I could understand why it's costs $, gotta make some extra cash somehow. Would be happy to pay a small amount for extras considering all the Time and effort mountain sheep put into/will put into the game, updates and future updates. Wait, is this game the secret project Mountain Sheep was working on? I only ask because there's a reference to Minigore in the picture. oops didnt click the link yet, this is not the secret project, secret project is the one that is worked with the company that created Geared i think, in this trenches game, the devs just mentioned minigore and pocket god thats all. I guess it's an average 3 months for every episode to be approved then. It's heeeeeeeeeeere ! ! ! ! Wish I could see a demo of someone getting past 6000 points. The game is too hard and those unlockables a far dream away. How many clips does it take to save Christmas?